I can’t help but find a lot of humor in this. Viva la pasión! Yes, I agree with Steve. 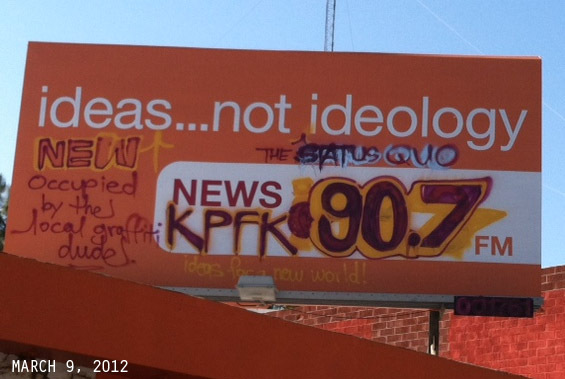 While I love both KPCC and KPFK, and this is clearly vandalism, I can’t help but love the sentiment. I wish we would all be as involved with societal dialogue/discourse as this “graffiti dude” was. Hilarious. I heard it was actually KFWB trying to stir up some ish! i heard it was KFWB tryn to start some ish! 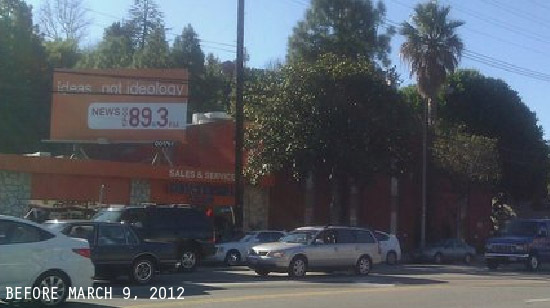 Hey, they made a conscious choice to place the sign a few doors from KPFK .. so what do they expect? Who were they referring to when they came with their profound “ideas not ideology” b.s. anyway? It would be great if someone could transport that sign and place it next to KPPC’s new digs in Pasadena. I’d love to see that. Low class and disrespectful, not to mention illegal and immoral. Would this be okay with you if the situation were reversed? I don’t think so. If KPFK won’t stand for tolerance and free speech, who will?